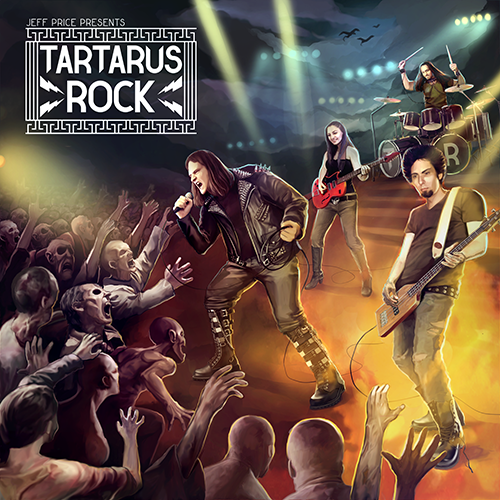 Shortly after recording wrapped on Tartarus Rock's debut album, Hades took his own life. We had a wrap party the night we finished and the next day he was gone. Even as I write this it's still surreal. Like any day he's going to call me up to get together to show me a song he needs guitar work for, like he did so many times just before he passed away. Hades was really the driving force behind this album: he's the one who had the idea, he's the one who got the rest of us together, and he's the one who wrote the songs. So to think that he'll never even hear the finished product is the most puzzling thing to me. I figure, why not hang on a little longer and hear it? Maybe he was afraid the final product wouldn't live up to the album he heard in his head? Or maybe he knew exactly what it would sound like, and that hearing the real thing was just a formality? Regardless, he must have been in a lot of pain if he couldn't even wait that long. I guess that's the thing, I can't imagine the pain he must have been in in order consider death preferable to life. What was it like? Did it drag on him day after day until he couldn't live with it anymore? Or did it come and go in waves, until finally a wave big enough engulfed him? When did it start? What caused it? Did he even know what caused it? Would could have helped it...? We wish we had known at the time... and it's so obvious in hindsight, that's the thing that really hurts. He knew we would have been there for him... or at least I hope he knew that. What would it have taken for him to reach out? Did we let him down by not seeing the signs and reaching out to him? Or did we help him keep going a little longer? Did we help ease the pain? I really hope we did at least that much... but there's no way to really know. He didn't leave a suicide note, but I guess there was nothing left to say. The whole thing still hurts though... the fresh wound scars over eventually, but the scar still aches when the weather gets cold enough. So here's to you Hades. We loved our time with you. We love the album we helped you make. But we still miss you. It's really hard, but we're trying to put the pieces back into something more beautiful than before, like Kintsugi ceramics. Someday that might even actually happen. But the hardest part is that there's not a single thing in this entire world that anyone can do to help him now, even if that's the only thing we want to do. So we'll do what we can instead: encourage you to get help if you need it. If you're having suicidal thoughts (or depression, or any other problem, really) don't keep it a secret. It doesn't have to be this way. Tell someone, please. It could be a trusted friend, parent, or family member. It could be a therapist or counselor. There are confidential hotlines you could call right now and talk to someone who will listen and help. If you're hurting at all, please call them, they want to talk to you. This is only the tip of the iceberg when it comes to resources that can help you, but it's good place to start if you don't know what else to do. These resources are here for YOU, so please, use them.